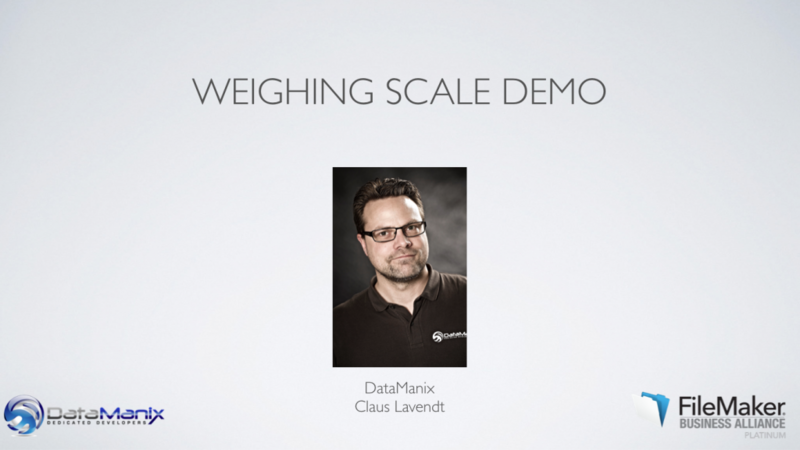 Here is a short video on how you can integrate a weighing scale with your FileMaker App. It is fairly simple and in the video I show you 2 ways of doing it. One way is to use a serial plugin, another is by using a serial-to-bluetooth dongle. The serial plugin way has the advantages that you can script all interactions. Basically, you are telling the plugin to listen for data from the weighing scale and run a particular script, whenever it receives any data. This script will then process the input from the weighing scale, which could be to put the weight into a field. The serial-to-bluetooth dongle method is more simple as you just need to purchase the dongle, insert batteries and connect the bluetooth to either a computer or iOS device. Then it will work just as if you were typing on a keyboard, except that it will be the weighing scale, that types the weight. The downside of this method is that you will need to have the cursor active in a field and you will need to setup onObject trigger to format the content. Also, most scales do NOT send a return character, which makes this a bit more tricky than if you e.g. integrate with a barcode scanner. You can download the FileMaker file below. Have a lot of FileMaker fun! Thanks for this demo. The Troi plugin is very expensive (similar to FMS @ $999). Have you found other plugins that serve this task well? I see that MBS has a serial component, but I’m not sure of it’s features yet. Thanks for the interest. The price tag for Troi Serial plugin is a developer license. We have worked with Troi plugins for around 20 years and found them to be the most stable and solid plugins on the market. Serial communication is a niche, which I think the price tag reflects. I know the MBS plugin has some serial functions, but I have not tested them. In contrast, their developer licence is €1.999,- which makes it more than twice expensive as the Troi Serial plugin. But this can make sense, if you are using many of the other functions from the MBS plugin. So this is a choice of yours. Thanks for the free aids for us beginners in developing with filemaker. Hope it will help your journey onto our great platform and that it will inspire you. Hi Claus, very interesting video. In fact I was testing a Kern scale a couple of weeks ago. I was wondering, how did you set the Kern to send data through the serial port? Is it on continuous mode? If this is the case, the script chooses only the last data it receives in the field? Thanks! The KERN scales have settings for only send when the scale is still. This means that the scale will only send the weight, when the weight is not 0 and when the scale is still. Look in the manual for further instructions. You could set it up to send continuously, but for most uses, we are only interested in getting the weight of an object, when the scale is still. Is there any way to achieve this on an iPad with FMGo? I should have been more specific – I have a BlueSnap from Serialio connected to iOS – I can get the weight in a FMGo field if the cursor is in the active field and I hit the Print button on the scale. I’m hoping to find a way to get FMGo to get the scale reading without hitting the Print button on the scale. It doesn’t seem that Troi serial is FMGo compatible – do you know of plugin that would go get the weight? This is a setting on the weighing scale – not plugin or software. Most weighing scales have the option to send the weight when the scale is still. Refer to the manual of your weighing scale.